The Mercedes-Benz Citan Tourer is the perfect van for a hard day’s work. But what about after hours? 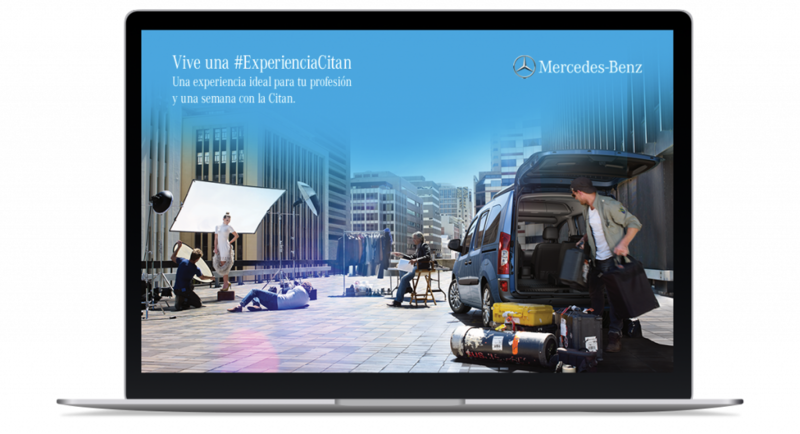 To prove that the Citan is also the ideal leisure-time vehicle, we designed the #ExperienciasCitan (#CitanExperiences) campaign for Mercedes-Benz Vans. Harnessing the creative potential of technology, we designed and carried out a unique promotional activity at the 2016 Auto Show, which received 116,518 visitors, where we set up a Citan Tourer with projections embedded in the windshield and side windows for 5 days. Go deep-sea diving while sitting in a Citan? Discover the wildest side of the African savannah? Take a trip to the stars? We made it possible! Visitors were able to climb into the Citan and enjoy a unique immersive experience thanks to cutting-edge technology that can turn a pane of glass into a stunning visual display. The campaign also included a landing page showing twenty different types of enterprising professionals for whom the Citan is the perfect work and leisure vehicle. Users were able to register on the website and enter a prize draw to win an experience tailored to their profession, plus one week to enjoy driving a Citan. All of this was accompanied by a flurry of social media publicity to inform users of the amazing event held at the last Auto Show.